Dental CSI – it may sound funny, but it's a very real science! Teeth are not only for eating, speaking and looking beautiful, but can be used in crime scene investigations with bite marks and extracted DNA. Dental ID, similar to fingerprint ID, is the most common form of dental forensics, a definitive means of identification of unknown human remains in forensic investigations. It is routinely acceptable as evidence in court. Because of the resistant nature of dental tissues to environmental assaults, such as incineration, immersion, trauma, mutilation and decomposition, teeth represent an excellent source of DNA material as scientific identification! Dental DNA can be used in anthropology as well! Earlier this month, doctors from the Massachusetts General Hospital threaded a scope up the neck and into the skull of a disembodied, 4,000-year-old mummified skull, in an effort to extract a molar. The tooth DNA was collected from the pulp of a well-preserved tooth and used to solve an "ancient art mystery," which could identify his or her gender and age from material lying deep within the pulp of the tooth. My experience with forensic dentistry was sad and shockingly personal – I had to send dental x-ray records to police department officials for identification of a friend killed in a plane crash. Even criminals are aware of dental identification. Just this past summer, reality show star Ryan Jenkins had been suspected of killing his ex-wife Fiore; the perpetrator removed her teeth and fingers to destroy her forensic ID. What he didn't realize was that the breast implants in Fiore's chest carried a serial number that was later used to identify the body, and subsequently issue a warrant for Jenkins' arrest. He committed suicide. Dental identifications have always played a key role in natural and manmade disaster situations, in particular the mass casualties normally associated with aviation disasters. In the attacks on the World Trade Canter on September 11, 2001, only an estimated half of the 2,749 victims were identified – through a mixture of DNA, jewelry, and dental records. 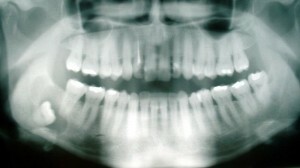 The deceased individual's teeth are photographed and charted with impression materials that can be compared to the dentist's patient chart, to make a positive identification. Forensic dentistry has also been used to identify several infamous figures from the Nazi era, including Adolf Hitler, Martin Bormann, Eva Braun, and Joseph Mengele. The assassin responsible for the murder of John F. Kennedy, Lee Harvey Oswald, was also confirmed through dental records. Even the remains of Czar Nicholas II and his family, who were shot during the 1917 Russian Revolution, were initially identified through dental identification. Forensic evidence in dentistry is a widely-applicable science in the identification of those individuals who cannot be identified visually or by other means or used as evidence utilized in law enforcement, but in scientific discovery as well! Teeth speak the truth!